The truth about how a Major League Hitter grips the bat and coming from a Major League Catcher, I saw how everyone gripped their bats. This Idea that MLB hitters go up with loose grips to somehow give them more whip in the bat in not only in consistent from what I witnessed for 10 + years in the big leagues but if that was the case, you’d see those hitters have less control over their barrel, they’d miss pitches, and lose power through the hands. The truth is that the hands and grip efficiently release the power the body generates, but when used incorrectly , it’s also vulnerable to lose control. Major League Hitters don’t flip flop their bat around in their grip, their number one goal for their grip is to take total control over the bat. 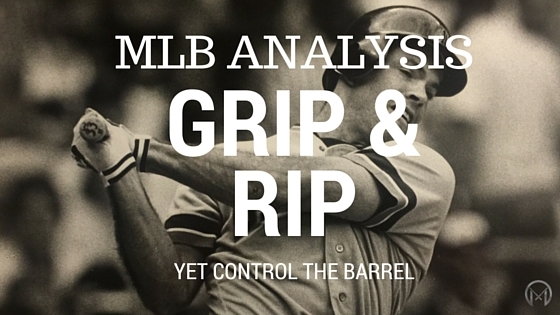 There are a few hitters who begin with an extremely relaxed grip on the bat but they’re extremely strong individuals and as soon as the timing phase begins and the seriousness of the situation kicks in to maximize the power release and make no mistake about it…the MLB hitter has total control of his bat with a firm grip when it’s time to hit the ball.